Fine artwork on playing cards is often constrained or wasted by the small size of each card, so here we have brought these wonderful paintings back to life. The textured surface of the cards adds to the visual enjoyment of these remarkable paintings, whilst the slender corner indices are not excessively intrusive. 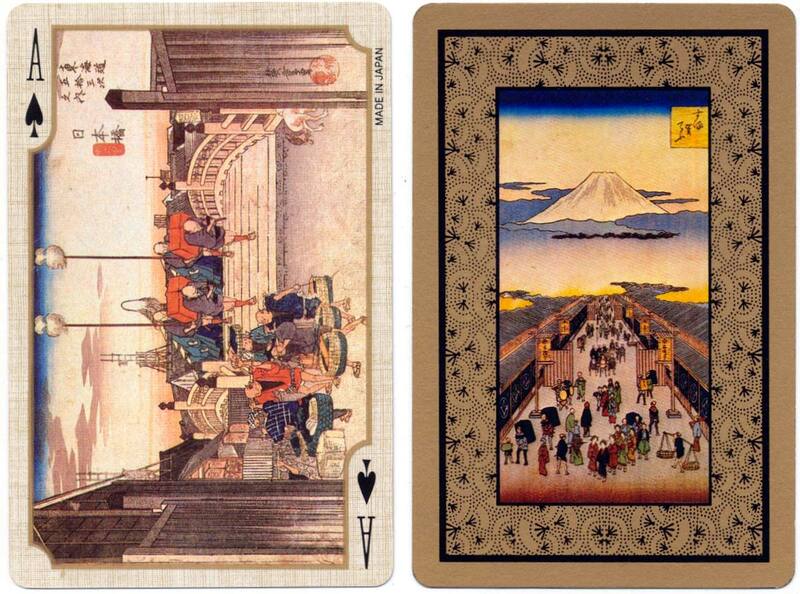 Below: “Hiroshige” playing cards drawn by Hiroshige Ando (1797-1858) at 53 stopoffs on the journey from Edo (Tokyo) to Kyoto, manufactured in Japan by Angel Playing Cards Co. Considered to be the last of the great Ukiyo-e masters, Hiroshige Ando (1797-1858) was most famous for his 53 stations of the Tokaido (East Sea Road). 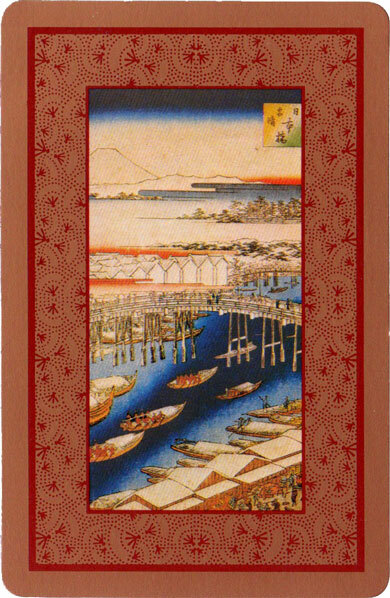 Hiroshige started to learn to draw at the age of 15 with Ukiyo-e artist Toyohiro Utagawa. He avoided beautiful women and concentrated on the Kabuki actors and Geishas for his human subjects but he mainly produced landscapes. The Tokaido was the main highway in Japan going from Edo (now called Tokyo) to Kyoto a distance of 450 km on the island of Honshu. In the 17th century the government set up 53 stations along the route with stables and somewhere to sleep for travellers to rest during their journey. It is still the busiest highway in Japan today. Ukiyo-e (浮世絵; Japanese pronunciation: [u.ki.jo.e]) was a Japanese genre of painting and woodblock printing with subjects typical of the decadent lifestyle of the middle classes from the 17th century to the 19th century. Their entertainment was the Geishas and the Sumo wrestling and often Courtesans. The Ukiyo-e, which means “pictures of the floating world”, depicted these interests with pictures of the Geishas and Courtesans as beautiful women and the Kabuki actors and Sumo wrestlers as heroes. The natural world was also depicted by some of the artists. Images and notes courtesy Rex Pitts. Above: an alternative back design. Courtesy Matt Probert.